This week their annual developer event Google casually announced a huge new feature coming soon to Android: Instant Apps. Chris Maddern called it their “one more thing” moment. When finally released, perhaps later this year, it could be the one of the most fundamental changes to the way mobile apps work since the App Store. What it won’t be, however, is an instant solution to the majority of app developer’s main problem: app discovery. Android Instant Apps, as they were presented during the keynote, will allow Android native apps to run immediately, without being installed, by essentially lazy-loading the relevant modules to the device at run-time. This will allow users to interact with your app and your content immediately, without needing to go through the hurdle of visiting the app store. Users can then (presumably) install the ‘full’ app if they want to. It’s easy to see why this is a big deal. The mechanics of installing an app involve a lot of physical and psychological friction: do I really want this app on my phone? Do I trust it? Will I ever use it again? Do I have the time to wait for it to download and install? Do I even have the space for it? (Anyone with a 16GB iPhone can attest to this being a very real and very constant problem). Apps could lose anywhere between 20 to 80% of the traffic that hits their app store page, so anything that helps eliminate this friction will be a huge win for app developers. Then it gets even more interesting with Android Pay. According to the keynote, Instant Apps will be able to integrate with Android Pay. If we assume this gives the app instant access not just to payment details, but identity and shipping details as well, you could easily imagine purchasing something you just discovered on the web in an Instant App with just a couple of taps. App linking will be smoother and involve less friction. Both Android and iOS have allowed native app deep linking for a couple of OS versions now, allowing developers to link into deep content views within other apps. This generally works great if the user has the target app already installed on their device; but if they don’t, the experience isn’t so great: the user is generally redirected either to a mobile-optimised version of the target product, and usually presented with a mobile app upsell ad; or they are directed straight to the app store, where the user needs to first figure out what kind of app this is, do I care enough about it to install it, etc. Some companies have been trying to improve this process, such as Branch.io who have built tools to allow developers to use ‘deferred deep links’, so that when the user does install the app after tapping a deep link they will be directed straight to the piece of content they were looking for directly after the install. But there is still heaps that can go wrong: the user needs to tap ‘install’, wait for the installation to finish, then open the app… So although deferred deep links help, they are a band-aid on an essentially sloppy user experience. Instant apps will solve this by skipping the whole store and to-install-or-not-to-install question. Because of this, I expect to see more developers engaging in app linking partnerships and leveraging such partnerships both to monetise their own users and also to grow by seeking partners to send incoming links. The NYC-based startup Button is building an exciting business around facilitating a network of deep-link-based affiliate partnerships, and through their SDK has also tried to solve parts of the app-install problem by bringing more content into the publishing app. Lots of brands and stores have apps already, but they all suffer from the app install friction as described above. It might be really handy to be able to place your McDonalds order in advance from the McDonalds app, but if you’re only going to McDonalds this one time, will you bother downloading the app, signing up, adding your payment details, etc? Instant Apps would allow businesses like McDonalds to allow customers to place their order, and pay for it, quickly and easily without needing to download anything. The example Google used in their keynote was paying for parking, without needing to install any app, and – more importantly – without even needing to know which app you need. Just ‘point your phone’ at the parking meter and via the NFC connection it can figure out what app you need, lazy-load in the needed module, connect to Android Pay and – boom! You’ve paid for your parking safely and securely. Or perhaps you’re in a new city and you want to buy a ticket for the subway, but you have no idea how the system works in that city (and we’ve all been there). Just point your phone at the ticket machine, and the appropriate experience to book and pay for your ticket pops up right on your phone. Given the ease of linking into rich experiences that this allows, I could imagine other, non-commerce use cases. Imagine Yelp issues all of its businesses a QR code. Then when you’re sitting in a restaurant and you’ve had a great meal, you could scan the code and go directly into a Yelp-powered experience where you can leave a review – without needing the Yelp app ‘installed’ on your phone. (And if Instant Apps allow users to access users’ identity, you don’t even need to create an account on Yelp either). It will be interesting to see if Google build some of the Instant App mechanism into the Play store directly. This could allow you to quickly ‘preview’ an app before you make the decision to install it. Screenshots, descriptions and videos are great – but nothing beats actually using the app. What if you could preview a working version before you install? Instant App-powered Trial Versions could become the next frontier of App Store Optimisation. Or what if this enabled free, limited trials of paid apps? Before choosing to drop $9.99 on that newest distraction-free text editor, what if you could trial it? This could also be great for games: like Shareware for the app economy. Will you even need a mobile-optimised website at all? If you take all of this to the logical conclusion, you start to wonder if you need a mobile website at all. (Ok, at least an Android-optimised mobile website, for now). These days plenty of businesses, such as Hotel Tonight, are mobile-only from day one; but for many others the web, and particularly the mobile web, remains an important discovery and conversion channel. For content-based businesses, it’s particularly important to have a mobile website to deal with the “app not installed” dilemma described above: when somebody discovers your content, either through SEO or a link from another service, you want to be able to show the user some content immediately. (Or you risk sending them directly to the app store and hoping they convert to downloading the app). 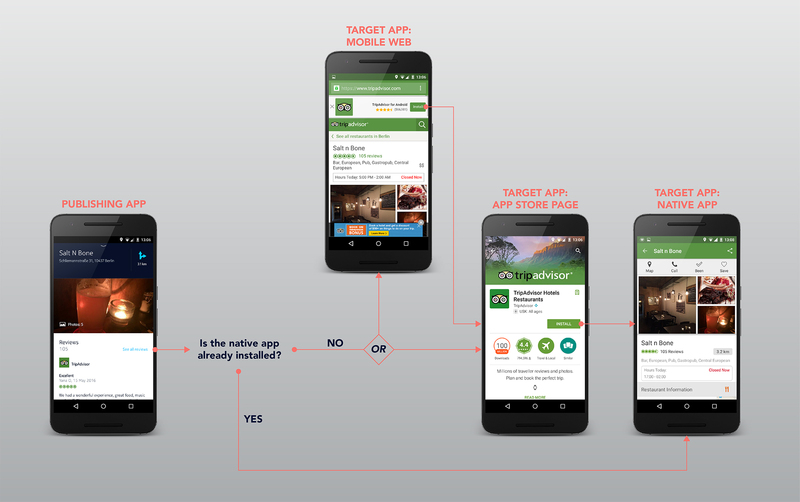 If Android Instant Apps can provide a real, native experience immediately, without downloading the app, why would you need to have a mobile website at all? You would shift your SEO focus to concentrating on Google/Firebase App Indexing, and shift your conversion funnel to the Instant App experience. Instant Apps could make the entire conversion experience for apps much more seamless, making it easier to access, consume and potentially test/trial apps. But conversion is only half of the app distribution problem: the second half. The first half of the problem is app discovery, and this is where I don’t see Instant Apps helping that much – at least not directly. Instant Apps will make it smoother to link between apps, and this could hopefully encourage a stronger ecosystem of app user/value exchange. This will help app discovery for sure. But the majority of apps are still discovered in the ‘traditional’ ways: word of mouth, content search, app store ‘browsing’, or performance/digital marketing. Instant Apps by and large won’t let developers circumvent the traditional app discovery channels. You still need to get your app in front of a user. What it does is dramatically simplifies the conversion process, allowing more users to interact with your app and discover its value – once they have discovered it. If you have a content or commerce-based business, start thinking about how to expand your reach through affiliate partnership building. Instant Apps will make consuming your content or service via a referred link in a partner app much easier and this can be a powerful source of acquisition. Where else can you include links that could surface deep views of your service without needing an install? In marketing materials? Affiliate programs? Start thinking about how to modularise your codebase now. For some apps it will be easy: Google says that some apps should be able to make the necessary changes within a day. But for other apps, depending on the architecture, it will be more complicated. Try signing up for early access to the program in the Android developer portal. But even if you don’t get in, start thinking now about how you will approach modularisation – is there a big architecture refactor you’ll need to invest in? This entry was posted in Mobile, Product Design and tagged App Discovery, google, growth, Instant Apps. Bookmark the permalink.